Whether you are planning to have an intimate wedding or an exorbitant one, Maharaja Banquet will surely match your unique choice, budget, and requirements. With a capacity of accommodating up to 400 in seating and 700 in floating, the venue has a cosy and comfortable interior for the guests. It also offers an in-house team of caterers that puts all the efforts to delight the guests with mouth watering multi-cuisine dishes. Maharaja Banquet, Mira Road, Mumbai, has a spacious hall that caters to all kinds of private events such as weddings, exhibitions etc. The venue is located at close proximity from Mira Road Station, Ghodbunder Road and Mira-Bhayandar Road. 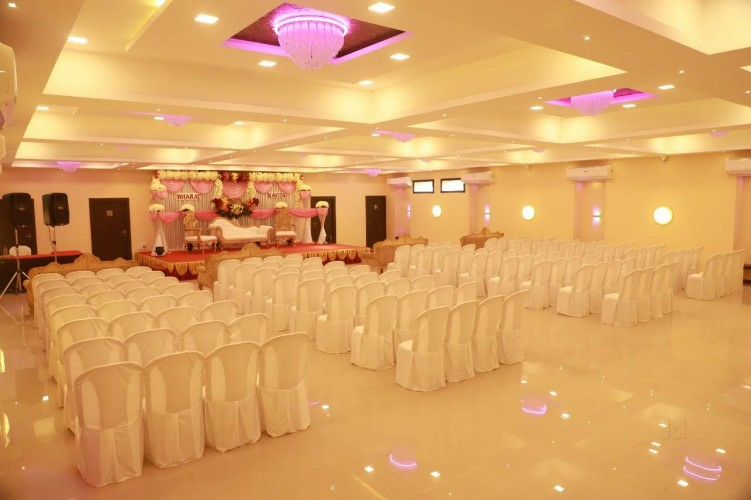 Maharaja Banquet Hall, Mira Road, is well maintained and blends well with any kind of decor. An additional advantage of Maharaja Banquets, Mira Road, is that it provides catering and decoration services as well. The venue has huge chandeliers and an inviting ambience which welcomes its guests with warmth. Maharaja Banquet, Mira Road, Mumbai, provides the option of getting alcohol from outside and ensures that your guests enjoy a well-stocked bar. Maharaja Banquet, Mira Road, Mumbai, gives you the freedom to get your own caterers on your big day and serve your favourite dishes to your guests. It also allows you to get your own decorator from outside and get decorations done as per your choice. The spacious banquet hall can accommodate a huge crowd for your wedding and reception.